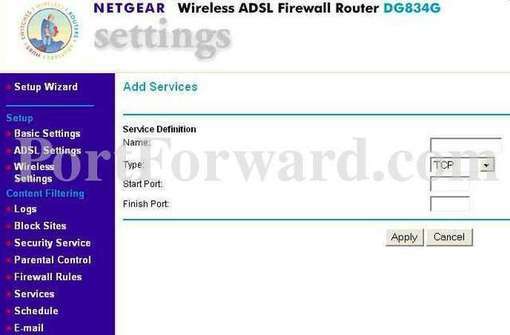 In this guide we will be showing you how to properly port forward or create an open port on the Netgear DG834 router. This router has a very basic firewall that helps to protect your home network from unwanted access from the Internet. A firewall is designed to do this by blocking connections to and from your home network. Some connections, of course, need are automatically unblocked for you to be able to use the Internet. There comes a time when you want some of these connections that are blocked to be unblocked, whether for a computer application or a game. This process of unblocking a connection is called a port forward because you are forwarding a port through the firewall directly to a device on your home network. Setup a static IP address on the specific device that you want to forward a port to. 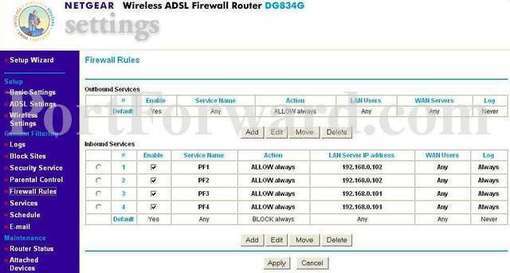 Login to your Netgear DG834 router. Make a port forward rule. Keep reading, we will walk you through every step in the process to get your ports opened for the Netgear DG834 router. It is now time to login to the Netgear DG834 router. This router has a web interface, meaning to login to your router settings you need to use a web browser. This can be Chrome, Firefox, Edge, Internet Explorer or any other web browser you would rather use. Do you see the address bar in the image above? Simply replace what is in this bar with the Netgear DG834 router's IP address. Don't forget the router's IP Address can also be called the computer's default gateway. You are in the right place if you see a place to enter a username and password. 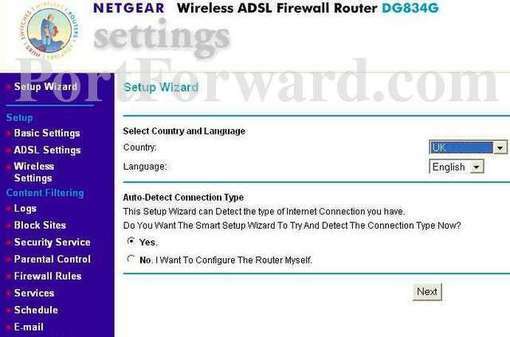 Once you have entered the username and password click the OK button to access the web interface for the Netgear DG834 router. 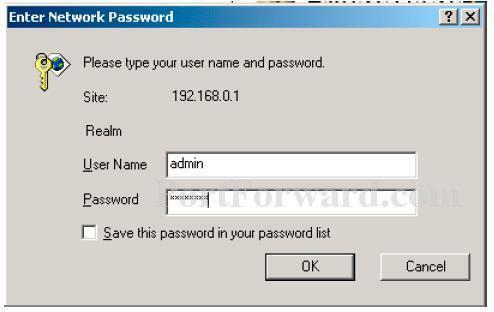 If the username and password did not work we recommend you try other Netgear usernames and passwords. Check them out here on our Default Netgear Router Passwords page. If you are still unable to login you probably changed the username and/or password in the past and have forgotten. Before you resort to resetting your router why not give our Find Password App a try. It helps to recover forgotten passwords on your home network. The following image should be the first page of your router. To forward a port simply continue on to step 4. Near the center of the page click the Add Custom Service button. In the Service dropdown box choose the service you created. In the Action dropdown box select ALLOW always. Enter the IP address to forward these ports to into the Send to LAN Server box. If you are forwarding ports so you can run a program on a device other than your computer then you can enter your device's IP address into that box. Use the WAN Users dropdown box to pick Any. In the Log dropdown box choose Never. 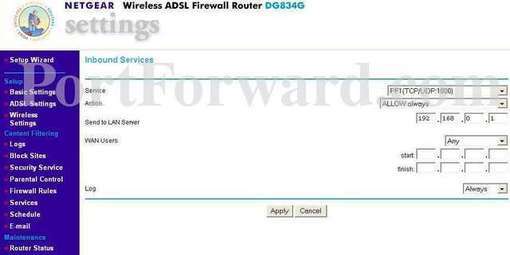 After you have finished forwarding the ports on the Netgear DG834 router you need to see if the ports forwarded correctly. We recommend using our FREE Open Port Checker in our Network Utilities. This Open Port Checker is the only one online that has Guaranteed Results. Learn more about how our free Open Port Checker works. How to Double Router Forward. Check out our huge selection of Router Screenshots. Learn more about Binary Numbers.